Happy Bday John Silver! 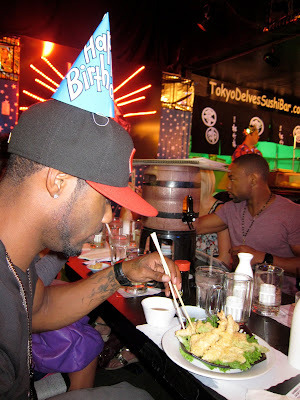 We Started the party at Tokyo Delve's and watched the amazing performance of the bartenders and sushi chefs, if you haven't been you gotta check it out. After the Dinner we headed to "joe's Bar" to have a few drinks. on to the next one... we left joe's for the Hookah bar!!! I love Hoookah! Finally we ended the night at H. Wood. Happy Bday fam!!! Every body met up at H. Wood for what??....SHOTS!! !